2017 was a tremendous year at RookiePreacher.com. Throughout the year, we published 133 new pieces of content and the site’s traffic almost doubled over 2016. We were able to help pastors preach and lead better from 175 out of 195 countries in the world. That’s remarkable! We were able to expand our team, too which I (Brandon) am really excited about. Our team of writers consists of yours truly, Joe Hoagland (co-founder), Peter Walters, Chris Pascarella, and Michael Voll. We’ve got a great team at RP and I’m so excited to see what helpful content we’re able to put together for you in 2018. The top five countries who utilized RookiePreacher.com were (1) the United States, (2) Canada, (3) the United Kingdom, (4) the Philippines, and (5) South Africa. Our hope and prayer have always been that church leaders at every stage of their ministry would find the content here to be helpful and actionable. From the feedback we’ve received over the last two and a half years, it seems that this is happening. 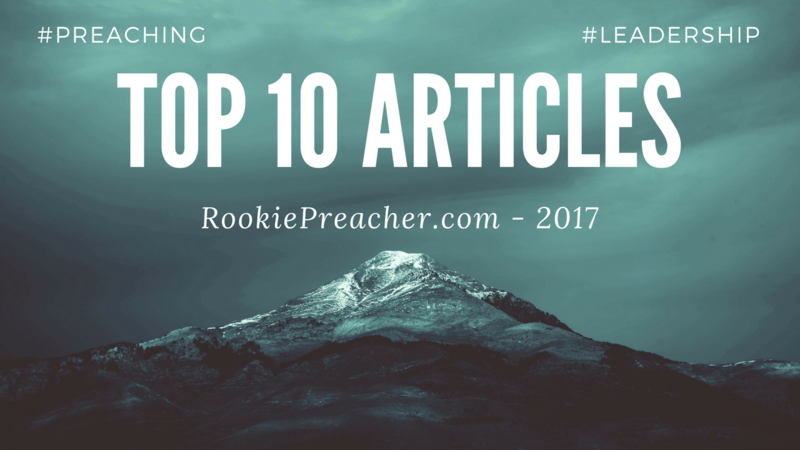 With all that said, let’s dive into the top 10 articles of 2017 here at RookiePreacher.com. The following are the top articles that were published in 2017. Below this, I’ll share the top 10 articles overall. Thank you to you, the RP community. It’s a blessing for us to be able to serve you and help you preach and lead better. Here’s to a great 2018! What kind of content do you want to see in 2018?